During the last week, illegal Israeli settlements and the BDS movement against Israel have become one of the hottest topics across the world thanks to the viral outbreak of Scarlett Johansson and her promotion of the SodaStream brand. The SodaStream factory is located in the industrial park Mishor Adummim, which is part of the larger settlement of Ma’ale Adummim. Beside the some 500 Palestinians working in the SodaStream factory there are in addition many Bedouins working for various Israeli factories and settlements across the West Bank. EAs visited a Bedouin community, Khan al Ahmar-Wadi Abu Sidr, where the men have lost their work in the Ma’ale Adummim area after refusing to demolish their local school. Eid Jahalin. Photo EAPPI/K. Ranta. Behind a busy new highway between Jerusalem and Jericho lies the Bedouin village of Khan al Ahmar – Wadi Abu Sidr which is home to 24 families, around 150 people. Originally refugees from the Negev desert, in 1951 they were forced to leave by the Israeli government and remain refugees until this day. All of the Bedouin from this community were born in the area where they now reside, except for one grandmother. 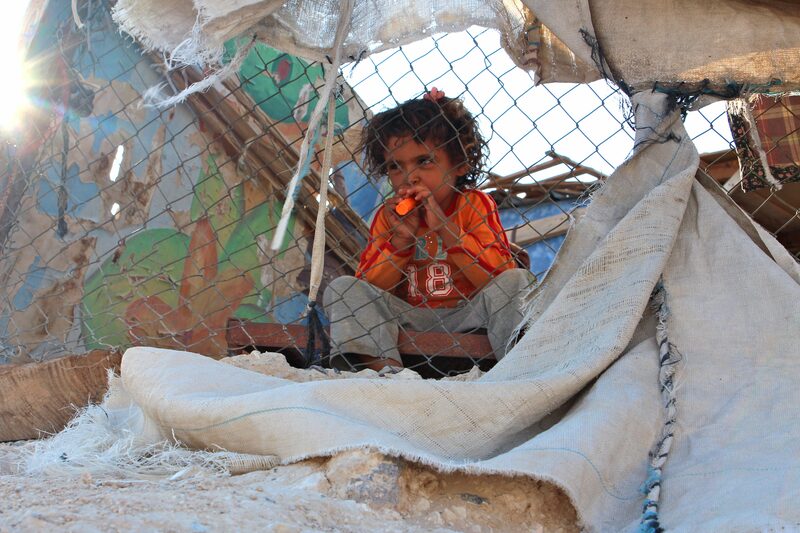 Bedouins are the poorest amongst the poor in the West Bank. Now bedouin villagers get most of their food from the United Nations. 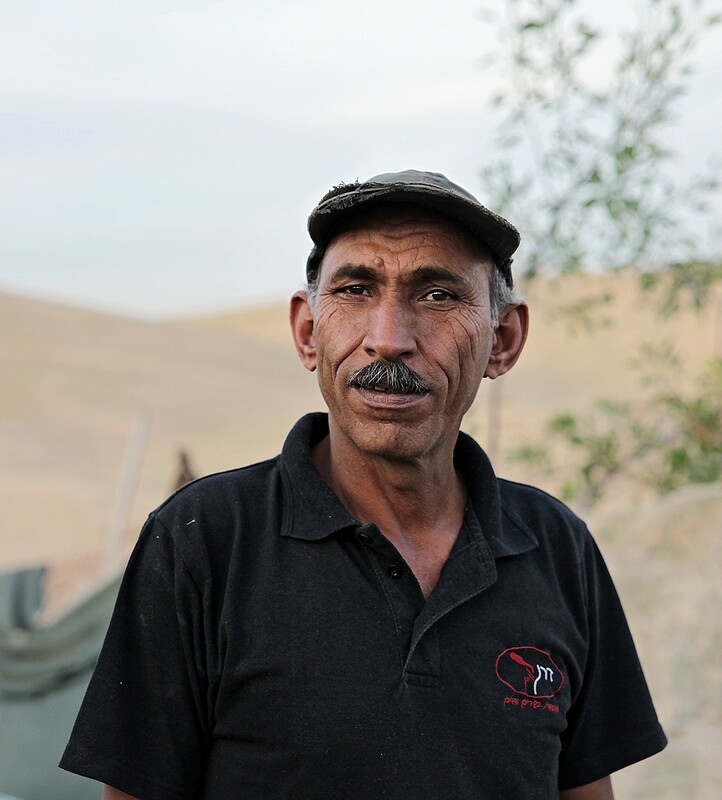 “Life was easier for us till the 1980’s, but then the settlement of Kfar Adumim was built and our incomes came down”, Nasser Jahalin, one of the bedouin in his 50’s tells us. Previously the Bedouins could sell animal products made from their sheep in Jerusalem and throughout the country. They used to take over 400 sheep to herd on the top of a high hill in front of their village, with a water source and lots of grass. Now, settlement houses cover that same green hill and private security forces patrol it. If animals get too close, settlers steal them. Homes in Khan Al Ahmar. Lights from the nearby settlement can be seen on the hill. Photo EAPPI/K. Ranta. 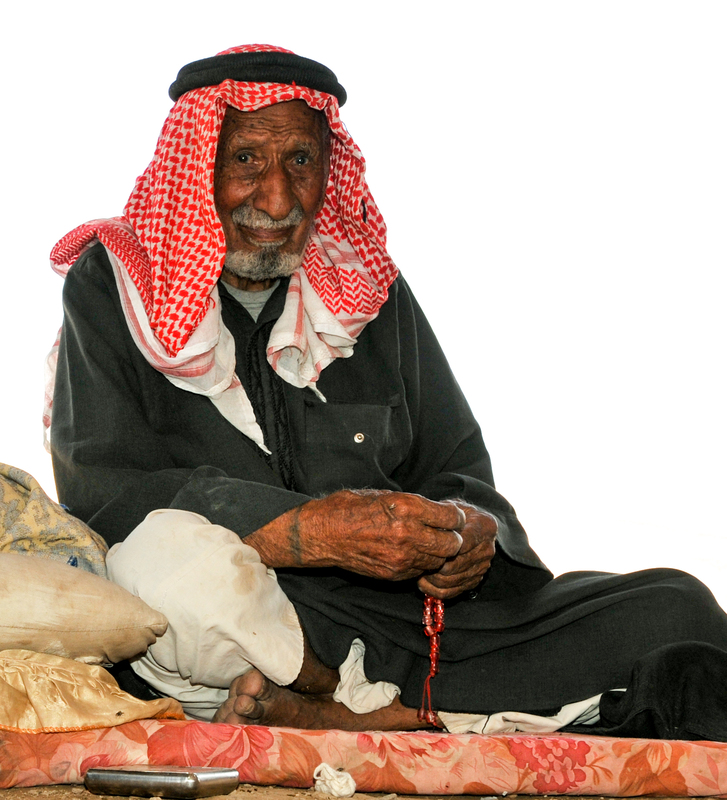 The Jahalin bedouin used to farm around 400 sheep, which were their main source of income. Now that they don’t have access to markets in Jerusalem, their herd of sheep is much smaller. Photo EAPPI/K. Ranta. Some 500 metres in the other direction there is a closed military area. There is a danger from unexploded bombs and additionally, army custody of their animals who graze too close to the area. Bedouins can only retrieve their property after paying a large fine. In the daytime, around 3 o’clock, armed settlers from Kfar Adumim may come close to the village to threaten Bedouin families or to steal their animals. Eid Jahalin a 49-year-old leader of the community used to work construction in the very same settlement for 15 years. 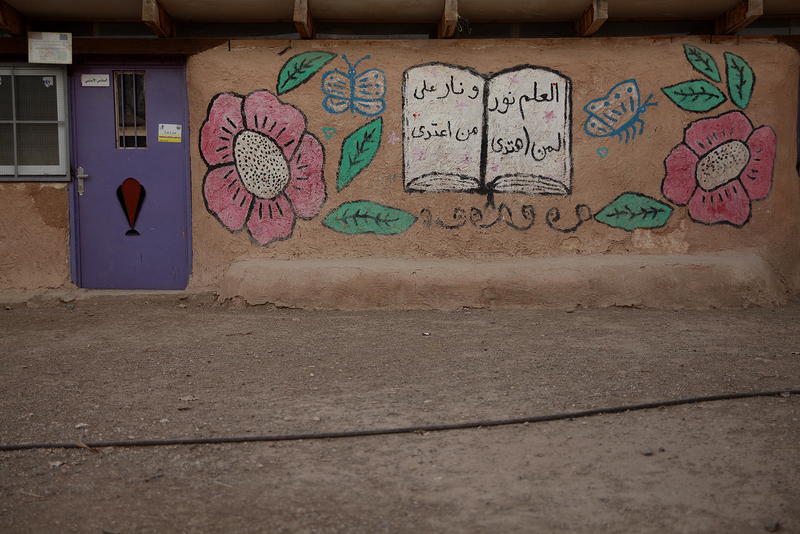 Palestinians, Israelis, and Internationals worked together to build the Tyre school in Khan Al Ahmar. After building, most men in the village lost their jobs in nearby settlements and factories. Photo EAPPI/K. Ranta. According to Eid Jahalin, everything changed for the Bedouin when they decided to build a school for their children in 2009. 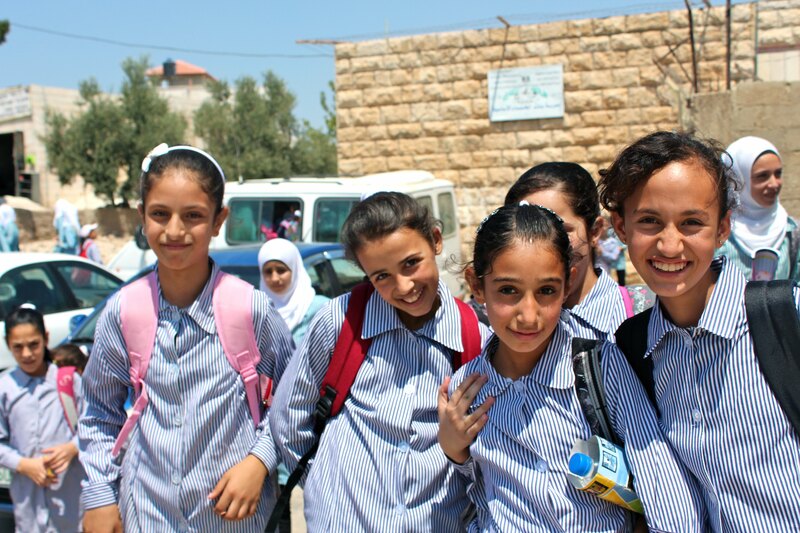 After building the school, all the men lost their work in Israeli settlements and factories. Before the school Nasser Jahaleen worked for the Israelis for years, but like others, he lost his work. Nowadays, only two out of about 50 men from the village have work in Ma’ale Adummim. Eid continues, after building the school, threats against the villagers increased . During night when the villagers are about to go to sleep, Israeli military or civil police frequently enter the community for house searches, forcing people out from their homes. 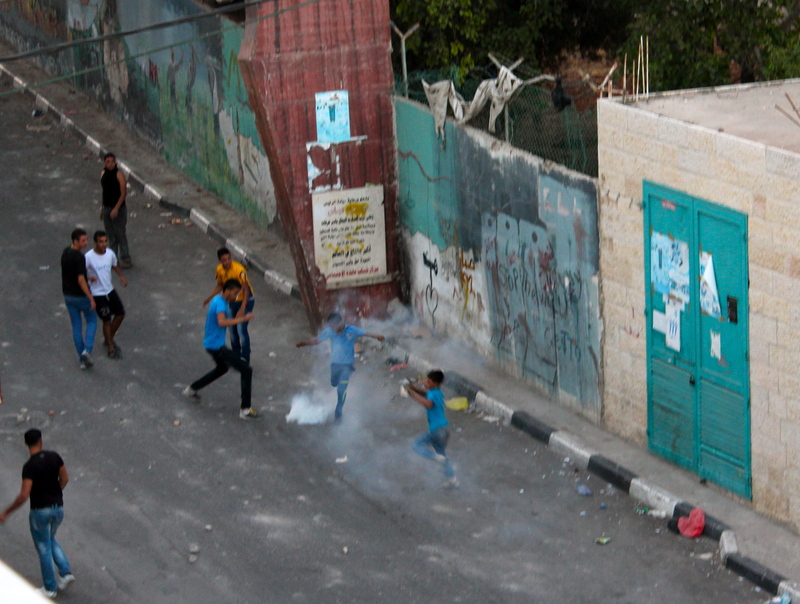 During the last week the Israeli authorities entered the village on four different nights. Each home in Al Khan Ahmar – Wadi Abu Sidr has a demolition order. According to Amnesty International, the Israeli army plans to evict and transfer 2300 Palestinian people from the Ma’ale Adummim area to the Jerusalem municipal garbage landfill to make space for settlement expansion. Ma’ale Adummim is located in what is known as Area C, which includes the E1 plan to build thousands of new settlements and commercial units in its expansion to connect the area with Jerusalem. It is planned that the whole area of Ma’ale Adummim and Mishor Adumim is to be surrounded completely by the separation barrier already under construction. Eid Jahalin urges international companionship. “We need all our international contacts to support us or otherwise our village and our lives might get lost, international people are are our voice in the world”.